Looking for a low-growing, flowering perennial that will impress your friends and neighbors when they visit your garden? 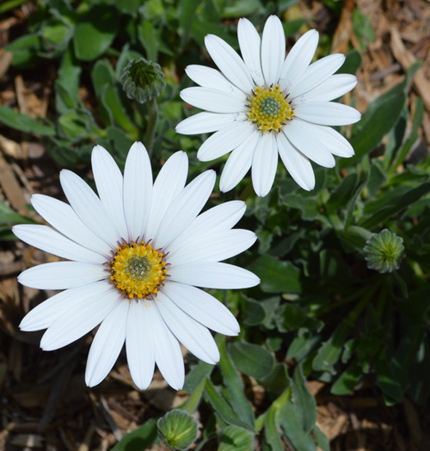 Look no further than the vigorous mat-forming daisy, ‘Avalanche’ White Sun Daisy. This cultivar, named to the Plant Select program in 2011, is related to other sun daisies, whose genus is originally native to South Africa. A shimmering riot of white, daisy-like composite flowers are produced above a mat of oblong, nearly succulent dark evergreen leaves. This variety of sun daisy is more disease resistant, blooms more heavily, and is more cold hardy than other Osteospermum cultivars. The numerous blooms close at night, showing off their metallic undersides of the petals. Consider reserving a spot for this ‘Avalanche’ in your xeriscape or in the front of your sunny perennial planting beds. Water Requirement: Low to medium water needs. Seems to do equally well in dry conditions or with supplemental irrigation. Exposure: Full Sun to light shade. I have experimented with it in my garden in afternoon shade, and it seems to do quite well. Soil: Adaptable. I have planted it in some pretty heavy, poor clay soil and it seems to thrive there unlike many other Xeric perennials. Flower Color & Bloom Time: Flowers are white with yellow-green centers, exhibiting a unique metallic tinge on the undersides of the petals. Blooms appear in early to mid-summer and continue in fall through the first frost. Sometimes flowering will slow down in late summer or in really hot, dry weather. Disadvantages: I have not found any to date. Some literature mentions that Osteospermum plants are susceptible to fungal pathogens. Best Features: The flowers are beautiful, but to me what really sets this plant apart is the mass of dark green foliage. In the right conditions it develops a wide mat of dark green foliage that acts a groundcover, spreading up to 42″ wide. 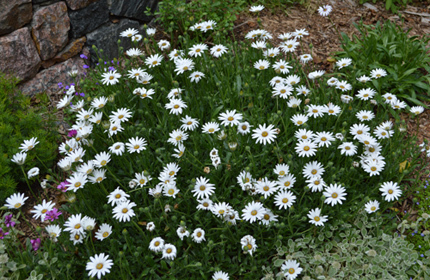 Maintenance Tip: While drought tolerant, Avalanche White Sun Daisy will produce the best flowers and mat of foliage if it is watered once or twice per week during dry periods.